If you have a lot of gold or silver shank buttons in your button box, especially if you are fortunate to have inherited some vintage buttons, this is a really great gift for someone. You will need at least 55 buttons, so you will have a few extras, as you might want to change out a couple as you go along or at the end of your project. Other supplies needed are 55 jump rings, a medium sized toggle clasp, and 7 or 8 inches of flat length medium sized chain to fit your wrist. Keep in mind that the toggle will make the bracelet about an inch larger in size also. I prefer split style jump rings, as they will slide onto the button shank and then onto the links of the chain and hold secure. I used a size 6mm or 8mm split ring. You will need 55 of those for your bracelet. 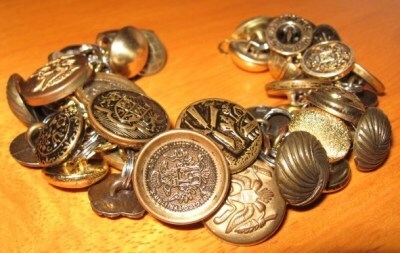 Start putting the jump rings onto your buttons first to get them ready to slide onto your bracelet and also put the same style or similar buttons into groups, so you can vary the buttons nicely as you go along. Start sliding your buttons on one side of a link and then the opposite side, and just keep adding until you get to the end of the chain. I leave one link at the ends to attach the toggle clasp on, using one of your extra split jump rings. Such a blessing to see, I'm glad you posted this. I am inspired to make one of my own. Have a great day! Yeah, I have CONTAINER FULL OF ALL STYLES OF BUTTONS MY SISTER LEFT WHEN SHE DIED. Great ideal. Thank you so much for your thumbs up everyone! I truly appreciate your help in winning this contest! These are so cute! Can't wait to make my own. This reminds me of the button string my grandmother helped me make when I was a little girl. I wanted one like I read about in the Little House books! Some of them were old buttons she'd kept and they'd probably be nearly 100 years old now. Such a pity it got lost somewhere along the line. Thanks for submitting this! So glad you like my bracelets! Thanks everyone, and please keep on voting for them! They take a long time to make, but they are a labor of love! These look great! I'll certainly be on the lookout for metal buttons at yard and estate sales from now on. Thank you so much for the detailed instructions too. When you say slide on between links what do you mean?